Between 1942 and 1956, pack mules were a common sight at Camp Carson. The first shipment arrived by train from Nebraska in July 1942. The mules were used by Field Artillery (Pack) battalions to carry equipment, weapons and supplies over mountainous terrain. The most famous of these animals was Hambone, the pride of the 4th Field Artillery Battalion . For 13 years, he carried first sergeants up Ute Pass to Camp Hale. Camp Hale, located near Leadville, Colorado, was where the Army conducted cold weather and mountain warfare training. Hambone died in March 1971 and was buried with full military honors. Fort Carson is located at 38°44'45" North, 104°47'6" West (38.745744, −104.784907). 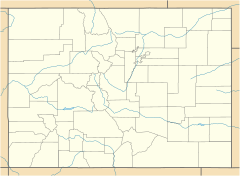 It is located in Pueblo County, El Paso County, and Fremont County. As of the census  of 2000, there were 10,566 people, 1,679 households, and 1,620 families residing in the CDP (the number increased to 13,183 by 2010 ). The population density was 1,126.8 people per square mile (434.9/km²). There were 2,664 housing units at an average density of 196.8 per square mile (75.9/km²). The racial makeup of the CDP was 62.8% White, 20.0% African American, 2.1% Asian, 1.7% Native American, 0.8% Pacific Islander, 7.9% from other races, and 3.8% from two or more races. Hispanic or Latino of any race were 15.4% of the population. On February 14, 2007, the U.S. Army announced it was moving forward with a plan to expand the Piñon Canyon Maneuver Site in southeastern Colorado. If expanded, Piñon Canyon would be the Army's largest single training area in the nation, tripling the size of the current site by adding 418,000 acres (1,690 km2) of private ranch land. At 650,000 acres (2630 km²), it would be nearly the size of the state of Rhode Island. ^ " City Council Districts." Colorado Springs, Colorado. Retrieved on December 10, 2017. This shows Fort Carson as outside the city limits.